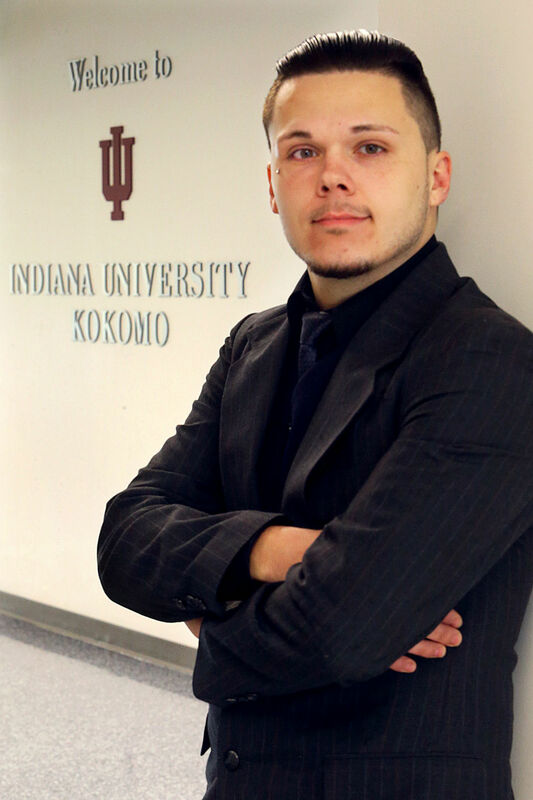 Tyler Sparger is a 22-year-old former addict who will begin studying law at Indiana University Kokomo in January. KOKOMO – Tyler Sparger knows exactly where he would be today if he never beat his addiction – in fact he didn’t even need to wait for the entire question to be asked. “Dead,” was his fast, blunt response. Sparger has been clean since around April 2016, and has a dream of becoming an attorney. But before then, he developed a drug addiction and overdosed twice in 2016, each time on a deadly cocktail of drugs, brought back into the land of the living with Narcan. But that’s not where his story starts, and it certainly isn’t where it ends. Feeling more comfortable standing than sitting for about half of a two-hour interview, the 22-year-old Sparger described his relatively mundane first step into addiction, the sordid depths it brought him and the people and faith that pulled him back out. When he was 10 years old, Sparger was diagnosed with Tourette syndrome, causing him to have uncontrollable twitches and ticks. His mother, Melissa Ballard, who sat with Tyler during his interview, said some of the involuntary movements were so severe she could clearly hear when his chin collided with his chest. It was a hard thing to cope with when he was young. It caused physical pain in his neck from consistent twitches, leading to tense muscles – an ache that developed over years. Additionally, other kids in school teased him about it. That combination of physical and emotional pain formed the groundwork that sprouted his addiction, Sparger believes – but it wouldn’t materialize until he turned 16. That’s when Sparger had his wisdom teeth removed. He got pain medication from the dentist, and said he took them in appropriate doses. That led to something of a revelation: the meds did more than treat the pain in his mouth; they helped manage his ticks. “After they were gone and from that point on I thought, ‘That felt good, I want to try some more,’” he said. Sparger started swiping pills from his mom and stepfather, both of whom also struggled with addiction. While simultaneously looking for a way to manage his Tourette’s and to get high, Sparger talked to his mom about getting prescription medication, and that’s just what happened. But, he said, he abused his various meds and never stopped taking the illicit drugs. The multiple medications and benzodiazepines made for a nasty combination that started to change him. That’s the state he found himself when he committed his first felony. Although he can’t remember most of that day – going to work, faces he saw, driving home – he vaguely remembers the act itself, in a fuzzy, dream-like kind of way. Sparger stole over $1,000 in merchandise from GameStop on Markland Avenue. Between the bits and pieces he recalls, said Sparger, he can’t quite say for sure what his motive was when it happened. He was interviewed by detectives and eventually charged with a felony count of theft, bonding out of jail a week later. That led to the loss of his doctor, and he was having trouble supporting his addiction – and that’s what led him further into criminal activity. “This is something that haunts me every day. I feel like if there was ever a time that I was the most manipulative, the most deceitful … this was the worst. And I hate admitting this, but I know I have to … because this shows where I have come from,” he said. Sparger started calling in fake prescriptions for himself, imitating the process he had seen his doctors go through. “I don’t want people to think that I’m … really just that conniving or that deceitful. And that’s what my charge was labeled – obtaining prescriptions by fraud or deceit. And that still to this day haunts me,” he said. He ended up landing two charges of obtaining prescriptions by fraud or deceit and one of counterfeiting, all felony counts. During a stint behind bars, he agreed to a court recommendation to attend a treatment facility in South Bend. “I think every addict deep down somewhere wants to be clean; they’re not always willing to really try to be clean, which was where I was at,” said Sparger. Ballard kicked a crack cocaine addiction years ago, and an opioid addiction more recently. For that reason, she understands her son’s struggle more than most – and gives them both something more to admire about each other. Sparger admitted that a big motivator for taking the treatment was reduced jail time. That backfired though when he made another attempt in South Bend to make a fraudulent prescription, landing him in jail in St. Joseph County. Meanwhile, an active Howard County warrant brought him back to Kokomo. Legal trouble would plague him – weaving a complicated web of charges, court hearings and jail time – his addiction would worsen and his regard for life would leave him. In February 2016, he overdosed on a combination of drugs that included heroin. Within a week, he would overdose again. “I should have died. I should have died on the spot, both times. One of the times I collapsed in Speedway on Washington and Markland, and the other time they found me in a car outside of CVS,” he said. That was the final scarring event before he went away to jail for a long stretch. First he was in South Bend for several months and then back to Howard County for several months, totaling in at around one year. “When I got incarcerated at the beginning of 2016 and released at the beginning of 2017 is when I knew it was time to change,” he said. Sparger started taking recovery seriously, a change of heart he mostly attributes to his Christian faith. “I’ve seen things, really just miracles within myself while I was incarcerated. …It made me happy that I knew I was going to be different when I got out this time, for my family, for the people that loved and cared about me,” he said. His final sentencing was for in-home detention. By that time, he knew he needed to pursue a goal – something he could accomplish that would have meaning. It all clicked into place during his final sentencing, while watching his public defender, Jeffery Elftman – someone he’s grown to greatly respect. Sparger decided he wanted to be a lawyer. Throughout the interview, Sparger praised various people he met in the legal system – people like Howard County Judges Brant Parry and William Menges, and his probation officer Josh Rosselot. He wrote apology and thank you letters to legal authorities he came in contact with during his legal troubles. Enrolling in the Twilight program, Sparger got his high school diploma and enrolled in Ivy Tech, where he received a perfect grade-point average. He’ll soon be starting at Indiana University Kokomo to begin studying law. In the interview, Ballard pulled out her phone and proudly showed a photo of Sparger in his cap and gown the day he received his high school diploma. “I knew he was capable of doing this stuff. Did I think he would do it?” asked Ballard. She took a second to think. “No, he’s right. I didn’t think he would apply himself – period. I really didn’t know what would happen when he got out of jail,” Ballard admitted. Eventually, Sparger wants to use his career to help addicts recover. “I … want to dig in so deep to the roots of this town and help the people here,” he said. And during a brief phone conversation, Elftman said he’s taken on something like a mentoring role for Sparger, and described the accomplishments already achieved by the young aspiring lawyer. “I meet with Tyler on a regular basis, because he is a success story. He often talks about how he looks up to me as a role model, and I always tell him I look to him as a role model,” said Elftman.